Minsk authorities refused permission to conduct a number of events in the centre of Minsk, including near the Opera House, where an application was filed by the Movement For Freedom (MFF), the Belarusian Social Democratic Party (BSDP), the United Civil Party (UCP), and the Belarusian Christian Democracy (BCD) party. 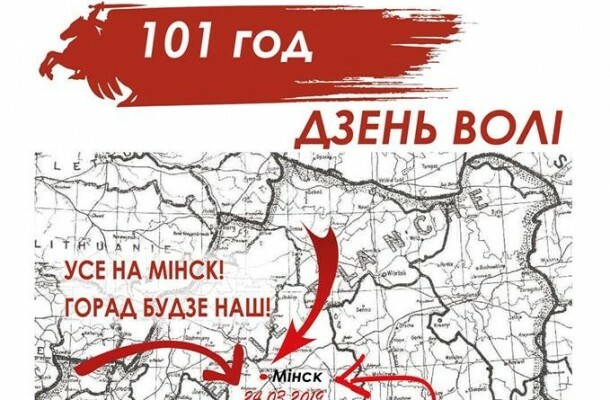 The celebration #БНР101 must take place in Minsk anyway. Therefore, it was decided to apply for an event in the Kiyeuski Square. There should be a legal place in Minsk to celebrate Freedom Day. A convenient large square with a stage and the ability to connect all the equipment. Good opportunities for coming by public transport. According to new laws, the notification principle is applied to such places: the preparations for the event may start from the date the application is filed. Freedom Day is not only a protest action, but also a holiday. The Kiyeuski Square is an opportunity to come together with one’s children and family. The festive program will begin at 1 p.m. on March 24 in the Kiyeuski Square and will last until the evening. • A rally with the participation of politicians. The main theme is defending the independence of Belarus. • A concert with the performances by N.R.M., Day Darohu!, Razbitaye Sertsa Patsana, Vodar, Kas, and Niakhay. • A fair with the participation of artisans. • A political tent camp. Just as the last year, one can get to know political organizations, their programs, and receive gifts. You can reach the holiday location from a number of underground stations by buses and trolleys — consult the map. Three needs of Freedom Day. How can one help? Very little time remains before the celebration. Therefore, we really need your help. 1. Volunteers. The events need help from people who are willing to be actively involved in preparing the program. If you are one of such people, please fill in the questionnaire and indicate what you are willing to do. 2. Financial assistance. Unfortunately, it turned out that all the money collected for the events of #БНР101 are unavailable today for the celebration in Minsk. The money is needed to pay for the work of the police, doctors, public utilities, the stage, and other expenses. 3. We also welcome artisans and entrepreneurs (a food court). Please, fill in the form below if you are willing to help create a holiday on March 24. As was previously reported, Freedom Day will be celebrated on March 23 in Hrodna. A big concert will take place there starting at 1 p.m. in Kalozhski Park. Additionally, festive parties will be held in many cities and regions outside Belarus on March 23 to 25. We invite you to a joint celebration of the 101st anniversary of proclamation of the BPR’s independence and look forward to meeting you in Kiyeuski Square on March 24!